PUPILS at Kingfield School in Woking were treated to a visit from a record-breaking vintage racing car, after winning a competition run by Brooklands Museum. 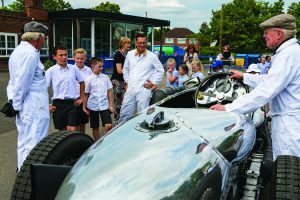 The appearance of the 1933 24ltr Napier-Railton came after the school entered the competition that was part of a campaign celebrating the museum being chosen as a finalist in the Art Fund Museum of the Year Award. The racing car broke many speed and endurance records both on the original Brooklands Track and throughout the world before coming into the museum’s ownership in 1997.